The Forza series is one that has been growing in prestige, standing out as the Xbox’s racing series and with ongoing prestige – the release of Forza Horizon 4 got a lot of people excited. 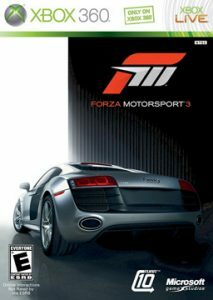 For me, after playing Forza Motorsport 2 I have to move on to the third game in the series. The second game seemed decent enough and I hope that will hold up. The basics of the racing game are, as always, good. The controls are decent enough and as boring as it sounds, this really meets those basic requirements. The question always becomes what the differences between them are. One feature that’s mentioned early is the ability to rewind. Basically, if you make a mistake, you can rewind the game to retry parts of it. As much as that would be helpful, though, it only rewinds a limited amount of time and, in my experience, not far enough to actually make a difference. If you’re on top of it, I guess it might be better, but the system felt a bit too limited for me, when as a starting player I assume I’d be someone this was focused on. The assists beyond that were a lot more useful. Breaking help especially helped me a lot – I tend to struggle with the low grip in the early cars and they help a lot with not needing that, with getting the right line and overtaking where necessary. Besides, they gave a decent idea of what the AI would do, so if you were going to overtake, you knew where and why. One of the nicer features is that there’s XP in the game to sort out unlocks. It means that progress through the game is less skill based – you could grind your way through, which means that it feels like you’re always moving forward and not wasting your time. The same with always earning credits – you can always get a bit further to upgrade your car. Forza Motorsport 3 is a good racing game. I can’t judge it for advanced player, but it’s accessible for beginners while there were clearly ways to make it harder and had some space to improve my times. There’s still a lot to unlock, too, so a lot more fun to be had.